An introduction to this month’s guest writer, Sharon Thompson, in her own words: I am a no-spray, composting gardener who has a yard, not a garden. A garden implies some sort of order, but making a plan and sticking with it is almost impossible for me. Originally from Kentucky, I have been gardening in South Carolina since 1978. Our former house had mature shrubs, big oak trees, and lots of shade. Our new house has small shrubs, big pine trees, and lots of sun. The one constant is red clay soil. I completed the Master Gardener program in 1993 and continue to learn about gardening and experimenting with old and new plants. I garden with the help of two dogs, two cats and a semi-retired husband who supplies occasional muscle power and frequent opinions. I enjoy sharing my gardening experiences by speaking to garden clubs and writing for several Master Gardener newsletters, The State newspaper, and regional magazines. Waiting in the grocery checkout line a few days before Thanksgiving, I flipped through the pages of a gracious-living-style magazine, lured by a cover-perfect turkey presentation. There, on page 181, was a spray-painted sweet gum ball wreath. 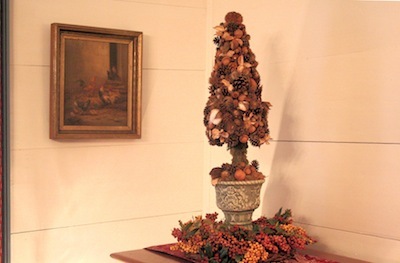 I immediately flash-backed to the early ‘70’s when I constructed a similar wreath, replete with nuts, pine cones and acorns as well as sweet gum balls. It had enjoyed a place of honor over various fireplaces as we moved around the country, then dishonor in attics and garages. After barely escaping a trip to the dump ten years ago, it is again prominently displayed at holiday time. Shocked to see a lowly sweet gum ball wreath elevated to acceptable heights of interior glamour, I was even more shocked to discover there was a source where sweetgum balls could be purchased. You need 125 to make a 14” wreath. You mean someone will pay for sweet gum balls? Sweet gums (USDA Zones 5-9) are one of the most common native trees in the eastern half of the United States. Most of them are on our property - or so it seems. They are one of the first trees to appear in cut over forests and abandoned fields, thanks to seed sown by wind and birds. Did I mention that it also sprouts from cut stumps and lateral roots making it capable of producing a grove of sweet gums? This is one insistent tree. Those decorator-friendly balls are fruits produced from fertilized blooms that appear in April. These same blooms provide nectar for early hummingbirds scouting for nesting areas, a silver lining to the cloud of balls that will come later. Once fertilized, the flowers morph into bright green prickly balls. In the fall as the seeds inside ripen, the fruit turns brown and little “windows” on the balls open so the tiny seeds can escape. Small birds like titmice and chickadees rely on those seeds during the winter and since each “window” on the prickly balls contains two seeds, the supply is generous. But, when the balls start falling, beware: those balls may have you slip-sliding if they get underfoot. The name sweet gum comes from its sweet, gummy resin or sap that was once used in ancient medicinal applications. According to Native Trees of the Southeast (Timber Press, 2007), the sap was also used as a “poor substitute for chewing gum.” Another common name, Alligatorwood, refers to the corky extensions that appear on twigs and the occasional corky spikes that appear on the trunks of young trees. Sweet gums make an excellent shade tree for large areas and provide food and shelter for a range of animals from bunnies to beaver. Its star-shaped, glossy green foliage, a host plant for Luna moths during the warm months, bursts into meteors of maroon, scarlet, or yellow in the fall. Often the leaves persist into winter so that as the holiday season arrives, trees are still graced with a few bold stars. Sweet gums grow into sizeable trees, 75 feet in optimal growing conditions of sunny moist soils, and early growth is rapid. The good news is that trees must be 20-30 years old before they bear fruit, so if you plant one, you have time to move away before the balls become a nuisance. Even better news: if you want the beauty of the foliage and tenacity of the tree without the nuisance of the balls, look for the cultivar ‘Rotundiloba’. Its star-shaped leaves have rounded tips and it sets no fruit. 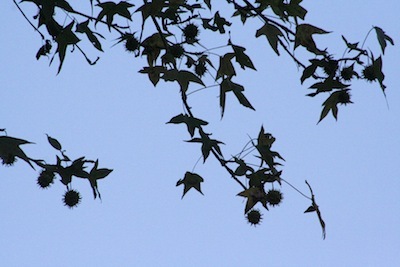 Note: The sweet gum ball tree pictured also has nuts, cotton bolls, and seed pods. It’s a good tree constructed by Gigi Huckabee.